WIRE STRIPPERCome with self-adjusting jaws ideal for copper and aluminum cables from 10-24AWG (0.2-6MM2). Thumb wheel micro adjusting swivel knob to strip wire smaller than 24 AWG. ZOTO strippers will not damage the metal part of the electrical wire. CABLE CUTTERCRIMPER:Built-in crimper crimps 22-10 AWG (0.5-6.0MM2) insulated terminals, 12-10 AWG (4-6.0MM2) / 16-14 AWG (1.5-2.5MM2) / 22-18AWG (0.5-1.0MM2) non-insulated terminals and 7-8 mm auto ignited terminals. The Cutter are made by special heat treatment, high quality blade performs efficient cutting. Copper only. NON-SLIP COMFORT GRIPPlastic & cushion grip handle, provides maximum leverage (PP& TPR) and increased comfort and reduced hand fatigue making the grip Self Adjusting. Wire Stripping Tool perfect for big or small jobs. the device is perfect for trimming wires and crimping need very little effort to use and save a tremendous amount of time when you stripping multiple wires. MULTI-FUNCTIONAL TOOLSpecially designed and precisely machined teeth grabs, holds, pulls and removes outer jacket in a simple one-handed motion; Also a wire crimping tool (crimper) which crimps insulated and non-insulated automotive ignition terminals and includes a wire cutter saving you time and money purchasing individual tools. PRODUCT GUARANTEEGuaranteed with money back in 30 days 12-month warranty,24 hours ZOTO outstanding customer service. 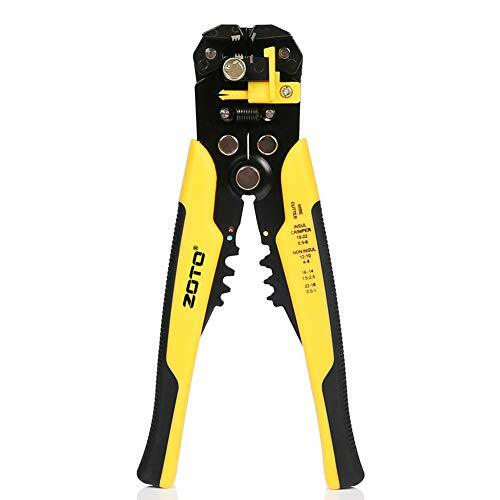 Notice: ZOTO USA is The Only Authorized Seller by ZOTO Brand, Please Make Sure You Choose ZOTO USA when you purchase this Wire Stripper. All New Sellers with LOWER PRICES on these listings are DISHONESTY and DANGEROUS,They just want to get your PAYMENY which means your package will Never Arrive or you will receive an EMPTY package.